While I’ve been crocheting pretty solidly for the past 12 years, I’ve only been teaching crochet for the past 20 months. During that time period, I’ve come across 3 left-handed students. I’ve done my best in trying to teach the basics of crochet, but part of me wishes there was a resource I could send them to that would give them the info they were looking for. I’m quite happy to say that resource is now available. I had the honor of meeting crochet author and designer Laurinda Reddig (http://www.recrochetions.com) at TNNA in Columbus, OH this past June. During the time we spent together, she asked if I would be willing to review her first book, which she self-published. When she looked for a copy to give me, she only had Left-handed editions available. 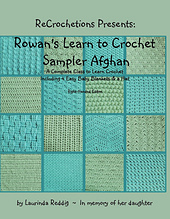 Even though I am a right-handed crocheter, I jumped at the chance to review the left-handed edition, because I knew there was a lack of resources out there specifically for left-handed crocheters, and I was hoping that this book would address that need. I am very pleased to say that this book doesn’t disappoint. Laurinda takes the left-handed crocheter from the absolute basics of making a slip knot, the two standard hook holds and how to tension yarn with the right hand, and then guides them on the finer points of making a chain, working into the chain, and then working into stitches themselves. Next, she moves onto the sampler squares themselves, with each one building up mastery of a particular crochet skill and/or stitch. Accompanying the directions are pictures – lots and lots of pictures, from the left-hander’s point of view – providing detailed instructions on how to make each stitch. These pictures are what makes this book such an excellent resource for left-handed crocheters, and will help them master basic crochet stitches in no time! Along with easy to follow directions and excellent picture tutorials for each stitch block, Laurinda has also used the book format to pass along crochet knowledge she has gathered over the years in the form of Quick Tips, Fun Facts, and Pattern Reading 101 info boxes. In addition, the book includes four blanket patterns, a hat pattern, and finishing instructions for putting the sample squares into a blanket. The finishing instructions are impressive, because they go beyond “weave in ends and join everything together.” Laurinda talks about blocking (! ), give two different ways to join squares, and explains how to make the blanket look finished by using an edging to tie everything together. One more note about this book. It is dedicated to Laurinda’s daughter Rowan, whose short life has inspired so much. Proceeds from the sale of the book go to Rowan’s Milk, a non-profit organization dedicated to providing education on lactation after loss to both mothers who have lost a baby and their health care providers.